I have also tried printing the data as it is filling the branch in this loop, and the correct numbers are being assigned to clustADCs. When filling an empty array with the data, the correct data is also stored, so I am not sure why the branch is not filling properly. Does anyone know why this is occurring? Your branch clustADCs is intended to be just a float or an array of floats? On the other hand, are you sure you need to write floats or rather doubles? Thank you for the help! This has seemed to fix the issue. After processing the data, however, there are values from the histogram that are missing. I realized that the number of entries in the tree do not correspond to the number of entries in the clustADCs leaf of the tree. For instance, while there are 199977 entries in the evtID leaf, there are 3358152 entries in the clustADCs leaf, which should be the proper number to run the loop over. I have been searching but cannot find a way to get the number of entries from a leaf object so that the loop will run over the proper number of entries. Any advice on this would be greatly appreciated! That should print as many clusterADCs as you wrote in your previous script (nev). The number of entries of a tree is obtained with t.GetEntries(). Ultimately the purpose of this program (only a snippet was provided in the original post) is to extract data from another root file, modify the contents of the clustADCs leaf and then write that data to a cloned root file without the original clustADCs leaf. At the beginning of the program, the original file is opened and the command nev = tree.GetEntries() returns the number of events (199977), which I presume is from the evtID leaf in that tree. However, the number of entries stored in the clustADCs leaf in the original file is 3358152, which would be the proper number of entries to loop over. Is there a way to retrieve the number of entries in the original leaf? The result of tree.GetEntries() does not correspond to any leaf, it is the number of entries of the tree. All the branches/leaves in a tree have the same number of entries, which is the value returned by tree.GetEntries(), in your case 199977, I understand. If a branch is a variable sized array and you plot a histogram of that branch, the number of entries in the histogram can be different from the number of entries in the tree, but these are two different things. How do you obtain 3358152? 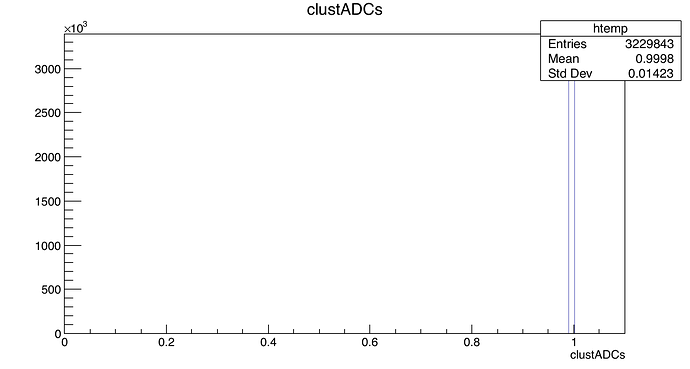 Is it what you see in the histogram plot for the clustADCs branch? That clarifies a lot, thank you! And then return the values for each, I get entries = 199978 and clustEntries = 3358152. 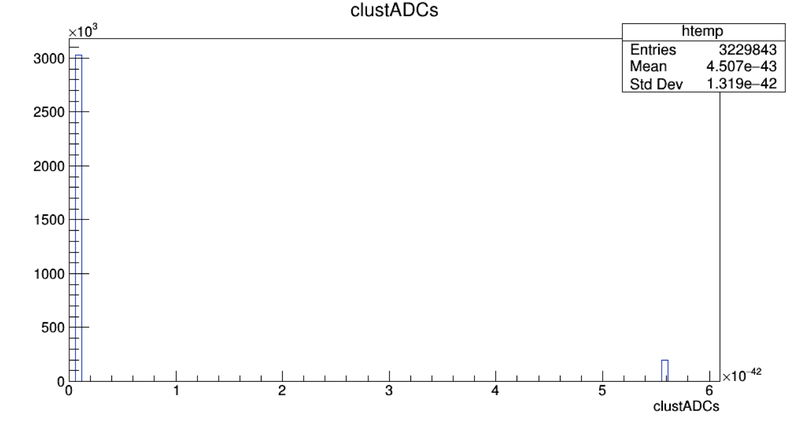 The value of clustEntries matches the number of entries in the histogram. So this is an easy fix then: just run a loop that returns both the number of entries in the tree and the leaf of interest. In order to extract the data I followed the tutorial at http://lcgapp.cern.ch/project/pi/Examples/PyAIDAProxy/examples/hippoDemo.html, but it appears that this link is no longer working. The code is very similar to the code reproduced in this post: Reading Values using PyROOT, which was based on code at a similar link (http://lcgapp.cern.ch/project/pi/Examples/PyAIDAProxy/examples/readTree.py, which is also no longer working). From your previous comments, each event does contain a variable array with multiple entries, and the number of clusters for each event are specified in the nclust leaf in the tree. I have been looking for a solution but have found no simple way to run a loop to extract the array of values in the clustADCs branch when running the loop over the events. For instance, the .GetValue() function only returns the first element of the array stored for each event. Is there a way to simply extract the array with a function? Or you could use an array.array or numpy array instead, whatever you like, to do the copy before the next iteration replaces the previous values. Also note that you can access the entries of the array individually, at every iteration you can do e.g. print(entry.clustADCs). where nclust is an array of floats cast to integers using nclust = numpy.array(nclustValues, dtype = int). When checking to see if the data were successfully written, a histogram with a mean of ~10^30 is produced which is certainly incorrect. Do you have any ideas or suggestions on how to correct this? Isn’t nclust an integer branch of your tree? If you run tree.Print(), what does it tell you about the type of nclust? you can check the length of the nclust_list list of integers at the end, it should be the number of entries. After that, you want to create a new branch of type array whose size for every entry is an integer of nclust_list? That does in fact work to retrieve the integer values and it does return the proper length. I think I understand now why the previous loop did not work. That’s correct; I want to create a branch clustADCs of type float array whose size for every entry is in the nclust_list, and will be filled with the modified data from the original file. In your case the branch will be linked to an array. You can declare an array.array variable in Python with a size that should be greater or equal than the maximum of nclust. I am receiving the following error: TypeError: a float is required for the line clustADCs = temparray, which is strange because even after declaring temparray = array('f', ) this same error occurs. Further, I have also tried passing a list of floats to the only element of clustADCs and this works just fine. Is there a subtlety that I am missing when filling this branch? Any suggestions are greatly appreciated. Then inside the loop, at every iteration, you need to assign values to nclust before running branch.Fill(). Also please check the link with the example I shared in my last comment, after the loop you need to Write to the tree to have the changes written. I have implemented this and it works! Thank you for the help. I think I was confused about how the data was being written to the branch. (I think the mean is slightly lower than 1 due to a floating point error). Using the print statements in the loop, I can verify that the correct data is being pulled from clust[jj][aa] and is correctly being assigned to nclust[aa], but the branch is not being written correctly for some reason. Is there something I am missing with this loop? Does it print wrong values?